Photo: Wide Angle of the Cove, with The Rocks on the left, Sydney Opera House on the right. See location - Map of Sydney Cove - Sydney Cove Map in the Early 1800s. Site of the historical landing place of the First Fleet in 1788 and the birthplace of the country of Australia, this small cove has been an integral part of Sydney’s history ever since. From the beginning, the Rocks restored historical district had been the center of Sydney’s maritime and trade. The first fleet convicts were first housed here in tents, then ramshackle huts to the early wood and stone buildings. The convicts were put to good use, being forced to hew the stone and help build many of the earliest buildings in The Rocks. About a hundred buildings of the city’s early days are now preserved here, including warehouses, government buildings, the police station and 19th century pubs. 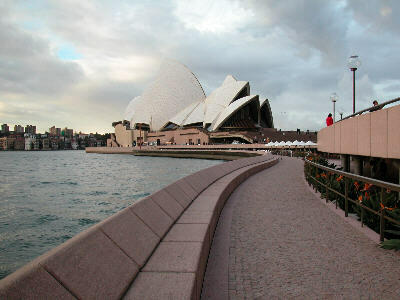 On the east side of the Cove is the Sydney Opera House, at Bennelong Point. You can take tours there, take endless photographs and just enjoy the majestic splendour of Sydney Harbour. You can also catch films, symphony orchestras, dance, international culture and stars and of course, Opera. The original design of the Sydney Opera House was by Jorn Utzon, who was chosen after an international competition was held. There was a large budget blowout, much political wrangling and media kafuffle before its completion date. But it was finally opened in 1973 and today stands out on the harbour, framed by the Sydney Harbour Bridge. Now home to the New South Wales Parks and Wildlife Service and the oldest cottage in Australia, there are displays about what life was like in the Rocks. You can also book visits to a number of the islands in Sydney Harbour, including Fort Denison and Goat Island. Cadmans Cottage was originally the home of Barnard Williams who had been convicted in 1804 at the Old Bailey for stealing silk and linen. He arrived in Australia in 1807 aboard the Duke of Portland. Prior to his arrest and conviction, Barnard Williams was a waterman on the Thames in London, upon arrival Barnard was put to work in the dockyard. Because he could read and write, he was given the task of record keeping. He became the New South Wales Government Coxswain in 1808 under Lachlan Macquarie, retaining this position for 14 years. As Sydney Harbour traffic increased, his responsibilities swelled. ‘Barney’ Williams, having put the farm in very neat order for them, built good huts for their residence and made a most excellent and romantic road from the landing place to the village. He died in 1822, leaving 6 children, Elizabeth, Ann, Mary Ann, John Barnet, Thomas George and Edward Henry. Their families continue to thrive in Australia today. At The Rocks, amongst the narrow twisting cobbled streets, you will find some excellent restaurants including Italian, Noveau Cuisine, excellent seafood including Doyle’s, a longtime aussie favourite, located in the Overseas Passenger Terminal. Whether your interest lies in shopping for that Australian gift, designer fashions, Australian art, arts and crafts, opals, jewellry and accessories, you will find them all at The Rocks. There is a lively weekend market with music, entertainment and bargains for everyone. Circular Quay, pronounced as ’Key’ is home to the train station and Sydney Ferries that can take you to the more distant parts of greater Sydney, including Watsons Bay, Manly Beach and Parramatta. You can also catch water taxis, Ferries to Darling Harbour, Balmain, Luna Park and Taronga Zoo. There are buskers there and it is always busy, especially during the day, from the many ferries, trains and buses exchanging passengers and workers, business people and keen surfers heading or coming from Manly Beach. This does not stop on weekends, in fact, it gets much busier and even livelier. You will also find Customs House, with a 3d display of the layout of Sydney, and nearby, the Justice and Police Museum on Phillip St. The Museum of Sydney, with excellent displays of historical displays combined with multimedia technology, is just one block south, on the corner of Phillip and Bridge Streets. The Museum of Contemporary Art is located just on the west side of Circular Quay, as is The Rocks. New Years Eve in Sydney has to be seen to be believed. It kinda looks good on the TV screen, but grand and majestic in real life, with the Sydney Harbour Bridge fireworks, the Sydney Opera House and City lights, all set on Sydney Harbour. One way to take in the night is to go aboard one of the many New Years Eve Harbour Cruises. Departing from Circular Quay are a number of Sydney Harbour Cruises, including lunch and dinner evening cruises. Sydney Ferries also operate cruises, and you can actually visit some of the islands in the harbour, including Fort Denison and Goat Island. Enquire at Cadmans Cottage, found between the Sydney Information Centre and the Museum of Contemporary Art. 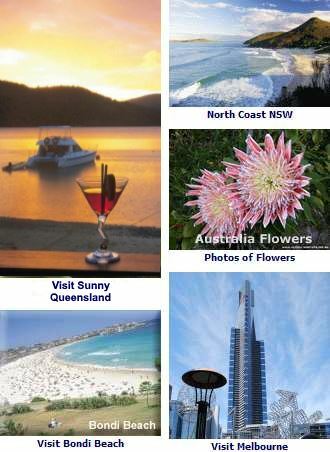 About cruises around and from Australia - Australia Cruises. Now cruises are available circumnavigating the continent, allowing you to see the country in real style. See also the World Youth Day Photos of the Pope’s Boat-A-Cade to the Cove. Sydney Information Centre - Offering visitors not only information, they have a good collection of artefacts and other items on display from earlier Sydney. See Sydney Map - Sydney Attractions.